Falvey’s Holy Grounds Café has new furniture! New tables, both round and square, surrounded by new, light green chairs and comfy armchairs with attached tables now fill Holy Grounds. 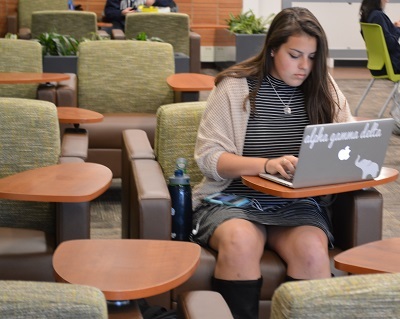 The new furniture arrived during Spring Break and students are already enjoying it as an enhancement of this popular, light-filled twenty four hour study spot. Holy Grounds’ new furniture was made possible largely through the generosity of two alumni, Fred Scoopo, MD, CLAS ’84, and Mariellen Scoopo, CLAS ’84. The Scoopos are members of the Villanova President’s Club which “recognizes alumni, parents and friends whose exemplary annual gifts of $2,500 or more bring distinction to the University and provide untold support to hundreds of current students.” The Scoopos are also members of Villanova’s 1842 Heritage Society, which recognizes and honors individuals and families who support the future of the University through estate gift intentions. Other donors also contributed to the furniture fund and we are truly grateful to all who helped make Holy Grounds a bright new place in which to meet, enjoy refreshments and study. Wonderful space for meets together for a meeting, coffee and reading. I love this place for their beauty of furniture and design. Thanks Alice Bampton to share this fantastic place with us.